Recently the Clinical Oncology Society of Australia (COSA) have recognised exercise as an integral part of standard care in cancer care and for it to be viewed as an adjunct therapy when it comes to counteracting the adverse side affects of cancer and its treatment. Exercise has many general benefits for your physical and mental health that are widely documented. However, when it comes to cancer treatment related side effects, exercise can be one of the best medicines for helping people cope with many of these side effects. Exercise has been proven to improve fatigue and nausea, recently there was a study done by the University of Georgia looking into the effect of chronic exercise on fatigue levels. In their meta-analysis more than 90% of the studies analysed showed the same thing: sedentary individuals who completed a regular exercise program improved fatigue, compared to those who did not. Nearly every group studied, from healthy adults to cancer patients and those with chronic health conditions benefited form regular exercise. It may seem counterintuitive but by expending energy and engaging in regular activity there may be a pay off with increased energy in the long run. Exercise has been proven to reduce depression and anxiety related to cancer treatment, increase appetite and control weight gain or loss. It can also lower the risk of developing lymphedema and help with anaemia. COSA’s recommendations for individuals going through cancer treatment is for all individuals to avoid inactivity and return to normal daily living as soon as possible. They recommend that all people living with cancer should aim to progress towards and maintain at least 150 minutes a week of moderate intensity exercise and two to three resistance training sessions each week. Exercise recommendations should be tailored to the individuals needs and goals and adaptations should be made for specific cancer-based treatment related adverse effects. 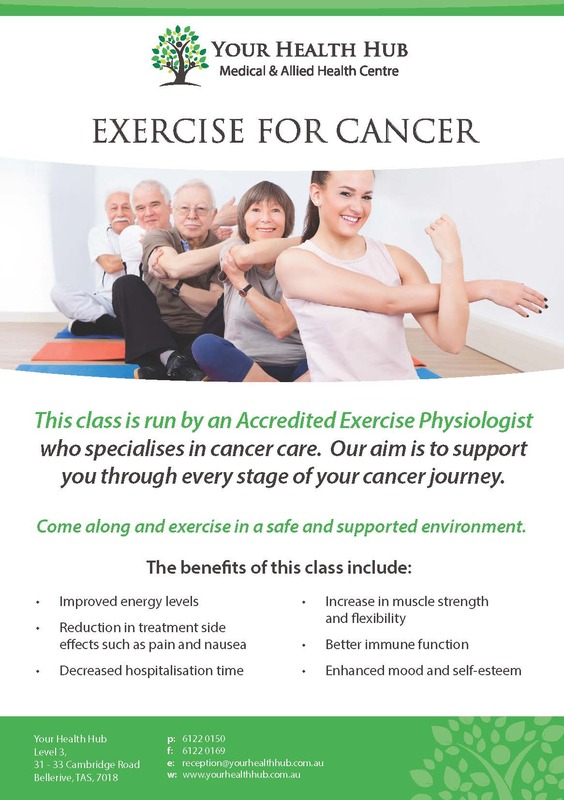 At Your Health Hub our exercise for cancer classes are run by an Accredited Exercise Physiologist and run on Wednesday and Friday afternoons at 2:15. The classes last for an hour and everyone completes their own individual program in a small group setting. Prior to attending the class, you need to book in for a 1-1 assessment with our exercise physiologist to discuss a detailed medical history and have your own individual program developed. Robb MacMillan is an Accredited Exercise Physiologist at Your Health Hub. Robb has a special interest in working with people living with cancer and heads up the Exercise for Cancer Program at Your Health Hub.